Two great American traditions get fiesta-style flair. What do Thanksgiving and tailgating have in common? At the heart of both events are good friends and great food. So if you are looking to rid your fridge of turkey leftovers and want to put a twist on your tailgate, you’re in luck. 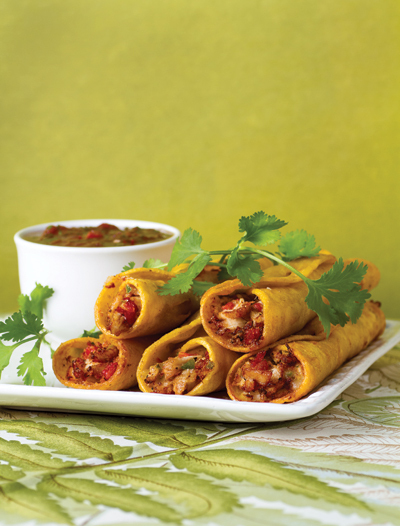 Turkey taquitos with cranberry salsa do double-duty to capture the flavors of the holiday season in a spicy new way. > Sweat the onion, garlic and jalapeno in a saute pan with 1 tablespoon of vegetable oil. Remove from the heat, and add to a large bowl. To the bowl, add the shredded turkey, cheese and tomatoes, and season with salt and pepper to taste. Mix the ingredients thoroughly. > Warm the tortillas in the microwave for 10 seconds so they are pliable. > Fill the tortillas with a tablespoon of filling and roll into thin taquitos, securing with a toothpick. Keep the taquitos covered with a damp towel before cooking, otherwise the corn tortillas will dry out and crack. Heat 2 cups of oil in a straight-sided pan to 350 degrees. Place the taquitos in the hot oil in batches and shallow fry until crisp, rolling to cook all sides, about 3 minutes. > Drain the taquitos on paper towels and salt. Remove the toothpicks before serving with cranberry salsa. > Place the cranberry sauce, cilantro, lime zest, lime juice, jalapeno pepper, onion, red pepper, green pepper, tomatoes. Add salt and pepper to taste in a food processor, and pulse until blended, but still chunky.